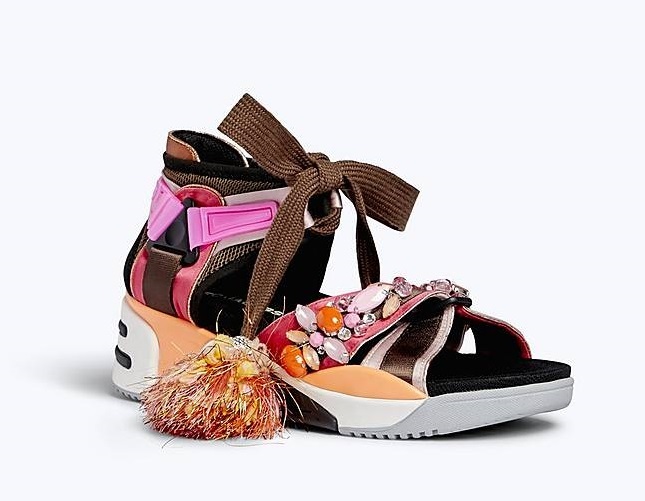 Flipping through a fashion mag recently, my eyes alighted on this fanciful footwear by Marc Jacobs. I know, I’m a sucker for anything with a tassel! And I’m also a sucker for taking inspiration from designer gear to refashion tired wardrobe items with bits and pieces from my haberdashery stash (haberstashery?). The tired items, in this case, are these sneakers (I can’t actually say they were ever really part of my wardrobe because they have been sitting outside for years and have faded badly; I was only ever wearing them when I needed to slip something on quickly to go to the local shops). I decided it was time to revive them and work them back into my wardrobe, like so! 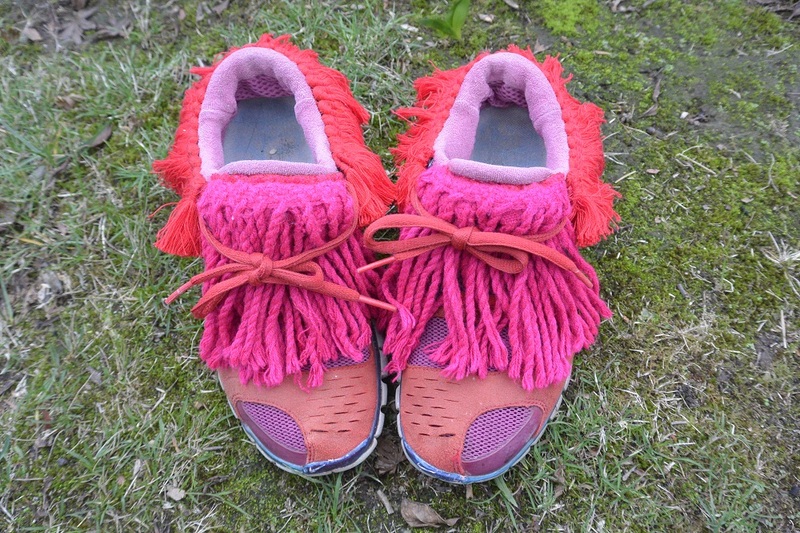 I had some pink fringing left over from a shawl that I made into a dress which I folded over several times until it was the width of the sneaker tongue, then hand basted it to the edge of the tongue. The red fringing was something I bought off the roll simply because I can’t resist fringing – I didn’t have a project in mind when I bought it. 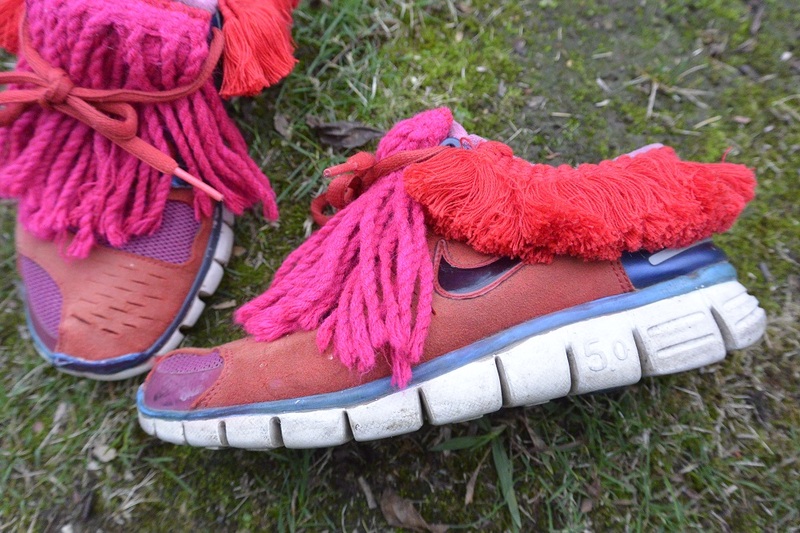 And now it has come in handy as a trim around the ankles of these sneakers, stitched roughly in place as I did for the pink tongue fringing. 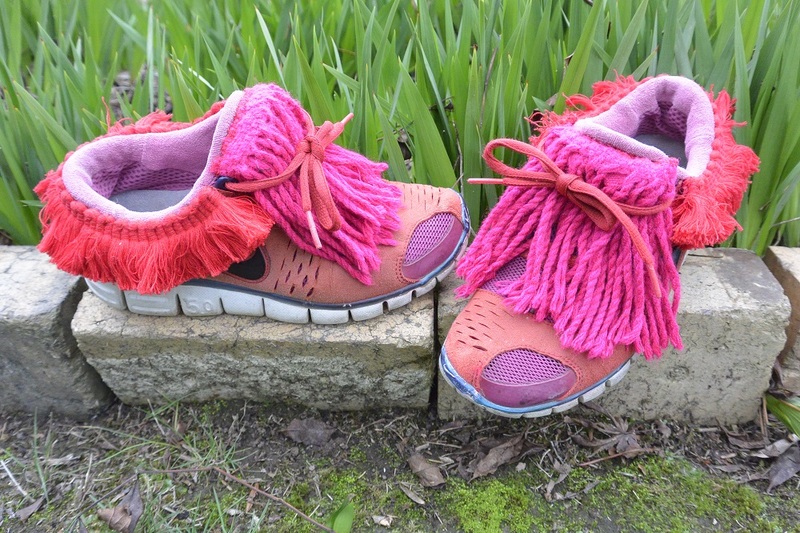 They remind me of mocassins… although I’ve never seen mocassins in these colours! 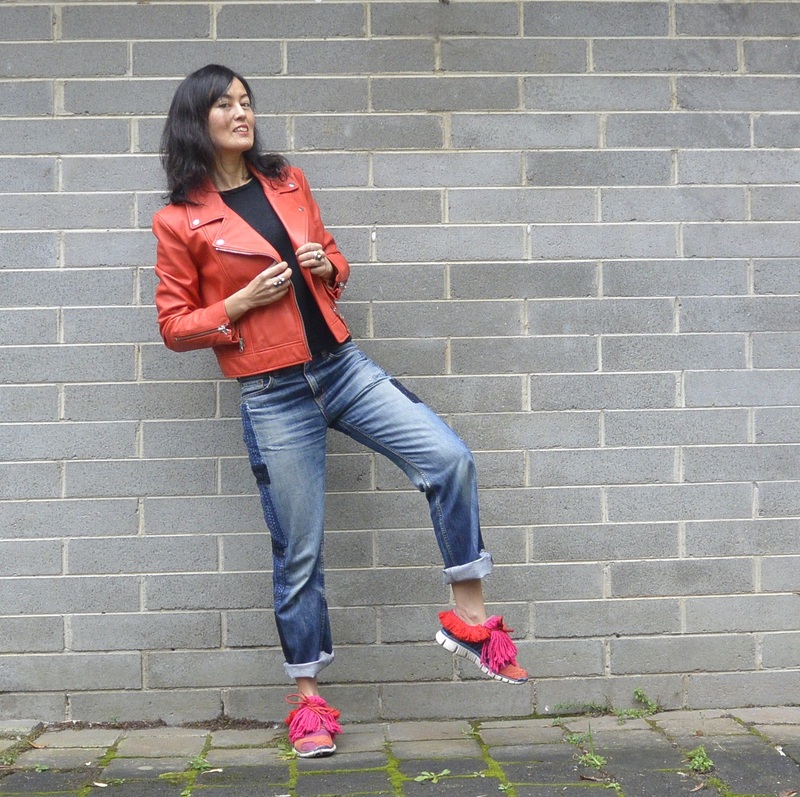 They’re not exactly wet weather footwear so I haven’t worn them out yet – and I haven’t been able to wear this jacket either. It’s red leather, by Gorman, and it’s not mine, which is why I don’t want to risk wearing it out in the rain! I borrowed it at the Tumnus pop-up that I blogged about last time, along with this Scanlan and Theodore dress (yes, there are some great pieces on Tumnus!). Somehow a whole month has nearly gone by and there’s another pop-up next weekend. I’m going to return both pieces, so if you want to give them a try, drop in and pick them up at the pop-up. Maybe I’ll see you there… and if it’s not raining, maybe I’ll be wearing my fancy fringed footwear. ← Share More. Wear More. Fashion for good. They look absolutely mad and I love them. It’s definitely worth buying those random bits of fringing and tasselly business whenever you see them!